As has been the trend, the ambient air and noise pollution levels for Deepawali 2008 were monitored by the Central Pollution Control Board (CPCB). The results after data analysis for Deepawali 2008 were finally what we have been trying to achieve since a long time. Findings reveal that noise levels as well as air pollution levels this year have gone down with respect to Deepawali 2007. Bursting of lesser number of crackers. Favourable meteorological conditions like increased mixing of height and temperature, both being higher than Deepawali 2007. This monitoring was conducted at seven and nine places all over Delhi, for air and noise pollution levels respectively. Level of SO2 declined considerably at all locations as compared to Deepawali 2007 and was in limits of prescribed standards. Other important constituents like Nitrogen dioxide (NO2), Suspended Particulate Matter (SPM), Respirable Suspended Particulate Matter (RSPM) also showed similar trends with few minor deflections. Shahdara, for example displayed a slight increase in air pollution (except SO2) and a small increase in pollution levels were observed at three locations viz. Sirifort, Shahzada Bagh and Shahdara. 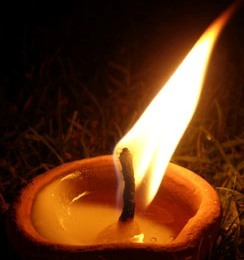 In case of monitoring of noise pollution levels, it revealed that ambient noise level at all locations of Deepawali 2008 increased as compared to normal day but it certainly decreased in comparison to Diwali 2007 and they were found to be ranging from 67 to 85 decibels against last year average of 65 to 87 decibels. Further, in general, highest pollution levels were observed during 2200 hours (Diwali day) – 0200 hours (next day) and all places of monitoring except Lajpat Nagar and ITO depicted a decline in noise pollution levels. So, the awareness or the meteorological conditions or the SENSEX FALLDOWN may be the reason for a cleaner Deepawali 2008, it’s a good news for all of us and the hard inputs to save Delhi seem to have begun to pay off now.